A movement meditation that opens gateways into the spirit realm and increases power for using shamanic energy. This will be followed by a Meditation of Passages to help harness this power. 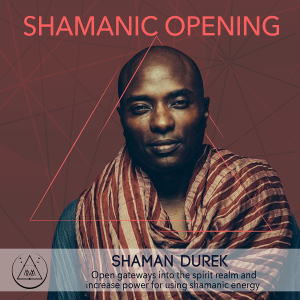 Shaman Durek is a 3rd generation shaman who has devoted decades to study and practice in becoming a thought leader and spiritual enthusiast for people all over the world. His focus is educating people on how to make shamanism a life style choice for evolutionary adaptation. He is an author, activist and a women’s empowerment leader. Day 1 is Passage of Awareness: you will open a passage that will increase your awareness and heighten your senses of dimensional space. Day 2 is Passage of Power: you will open a passage to increase power in your energy field that will stimulate your system and open the warrior energies inside your body to help you confront the fears within yourself that you’ve been holding on to.